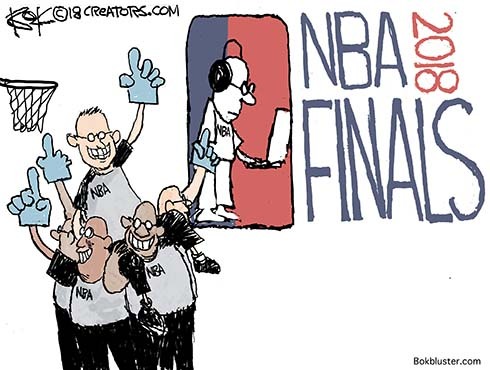 So far the NBA finals have been all about the refs. In game one they overturned a charging call against Kevin Durant and changed it to a blocking foul against LeBron James. Durant went on to sink both free throws and tie the game. But charging calls are only reviewable if the chargee – LeBron in this case – is thought to have been in the restricted zone. He wasn’t, but once the investigation was open they went after him for a different violation. His feet weren’t sufficiently planted when he took the collision. The NBA issues a Two Minute report on the officials after it’s all over and not reviewable. They say the prosecutors..er..refs got the charging call right. But Draymond Green should have been called for a foul against LeBron with 12 seconds remaining. Not only that, Green committed a lane violation on George Hill’s missed free throw with 4 seconds left. That’s an opportunity cost of three more free throws for the frustrated Cavs. 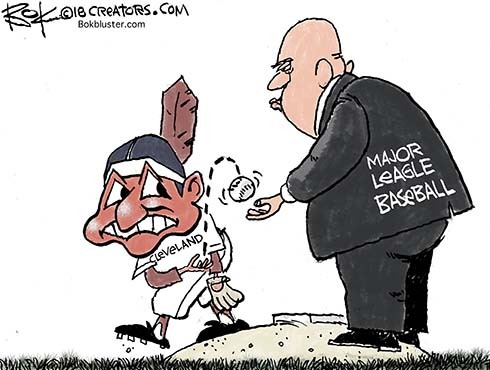 The Cleveland Indians 70 year old icon, Chief Wahoo, has gone the way of the image of The Prophet. Kind of. There was no rioting. There were no murders. Instead, baseball commissioner Rob Manfred offered Indians ownership a deal it couldn’t refuse. And Wahoo was sent to the showers. In exchange, the Dolan family gets to keep discreet licensing rights to the chief on promotional paraphernalia. And Cleveland gets to keep the 2018 All Star game. Probably. 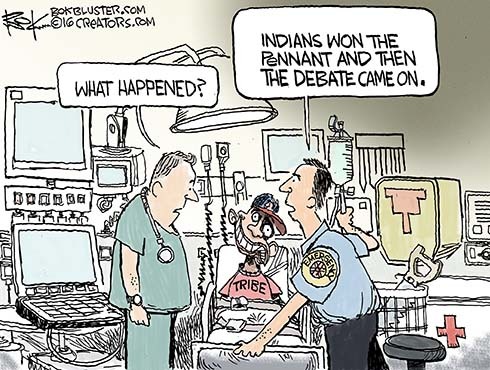 Tribe gear worn by the players, however, will no longer bear the graven image of the famed indigenous cartoon person. Instead players will sport the block “C” on their sleeves and hats when they take the field. Hockey players use high tech composite sticks. 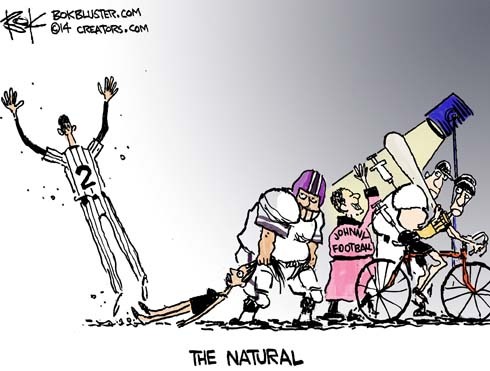 But major league baseball players use wood bats. And, in an age of encrypted digital communication, they stick to hand signals. 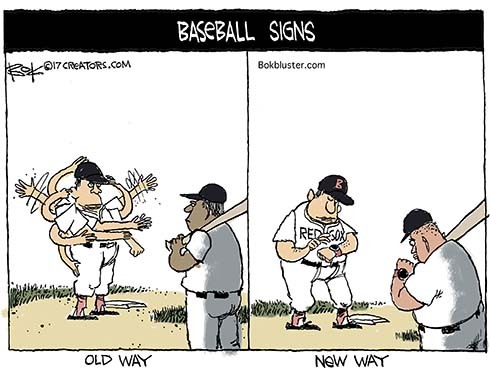 At least that’s what we thought until the great Boston Red Sox Apple Watchgate scandal. The Sox got busted for stealing signs and relaying them via Apple Watches. Got the idea for this one from a Daniel Henninger column of the same name. It’s not a coincidence. I stole it. But I did embellished it with a picture. Henninger links Jeter to Joe DiMaggio, another Yankee class act of a different era. DiMaggio was an even better player, plus he married Marilyn Monroe. Henninger’s interest is in great players who shut up and play by the rules. Jeter won the game with an RBI base hit in his last at-bat in Yankee Stadium. He won’t play shortstop again. But he will come to the plate as a DH at Fenway Park where Ted Williams hit a home run with the last swing of his career. He got chop single today in a 10-4 loss.